Sweden’s Enforcer has been around for a couple of years doing the retro-NWOBHM/traditional metal thing and this is their second album. I haven’t heard their debut (Into the Night) but from what I’ve read, most people seem to agree Diamonds is the superior album. I initially hadn’t planned on picking this album up for whatever reason but I saw it in FYE one day for $10 so I grabbed it. I’m glad I did. Enforcer’s take on the ol’ NWOBHM scene is very good. Much of this album sounds like it comes straight from some lost gem of the early ’80s metal movement (though the album cover looks like a ’70s glam rock cover). As much as I love Olof’s high-pitch vocals, my favorite track is actually “Diamonds” (“Nightmares” runs a close second), which is an instrumental. Look, what else do you want me to say? I’m not getting paid by the word! 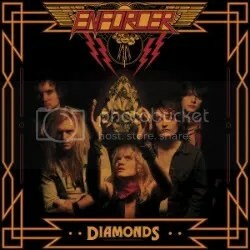 Diamonds is a good slice of heavy metal and if you’re into NWOBHM and the current crop of tribute acts, you’ll be into Enforcer.